The material is a shiny pure silk, high quality cloth woven to satin motive. This luxury and unique material has an attractive petrol green color. The bodice is embroidered by shining rayon threads. This hand embroidery is a combination of satin and needle-painting techniques. All inner seams of bodice are hidden, there is whole acetate silk lining of the red color, sewn zipper, nylon tulle petticoat and nice guipure lace on the edge of skirt. 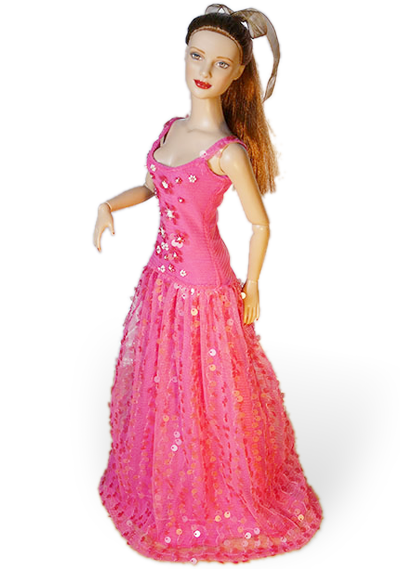 The line of dress is exactly fit for 16inch fashion doll as Fashion Royalty (FR16) and Sybarite (genX). It is also suitable for similar 16inch dolls as Urban Vita, Tonner etc. View the picture gallery with more and hi-resolution photos. The doll, shoes and decorations are not included!